According to Danish tradition, anyone waiting beside an elder-bush on Midsummer Night at twelve o'clock will see the king of fairyland and all his retainers pass by and frolic and amuse themselves in favorite haunts, including in mounds of fragrant wild thyme. Thyme is also said to have been one of the three plants which made the Virgin Mary's bed. Indeed, in European there are as many myths as there are quotations from the poets about this classic plant. Its very name, which is thought to derive from the greek word Thumon meaning "to fumigate", denotes that it was used as an incense in Greek temples. 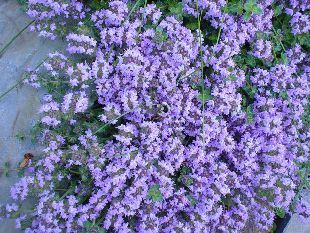 It is thought that Common Thyme was used by Romans extensively for bee culture. Greeks and Romans considered thyme to be an aphrodisiac. In was similarly used as an aphrodisiac by the French during the Renaissance. Both wild thyme and common thyme help with indigestion, particularly when fatty foods are involved. They both contain thymol, a poweful natural antiseptic substance. Herb tea made from wild thyme can assist in clearing of congestion and phlegm from the respiratory tract. It can be of particular use in assisting with coughs and colds, sore throats and infected gums. Wild Thyme can have a calming sedative influence and may help with sleep. As well as being antiseptic, Thyme oil, distilled from the leaves and flowering tops is an antioxidant and has been researched for anti-aging properties. A few drops in a bath will help the skin if it has been harmed by minor cuts. Thyme oil used externally may also help overcome depression. Pregnant woment should refrain from drinking thyme teas. Discover more about Herb Gardening and find out what Herbs are. Home for flowers, plants and more at Piglette.